I am big fan of the post office in general and of my local post office in particular. I go there as often as I can (honestly, I do). But, when I needed stamps on Monday, I was not prepared for the line snaking out the door. I had completely forgotten about tax day! I girded myself for a long wait, but the clerks were the very picture of efficiency and I was in and out and all stocked up on bonsai stamps in ten minutes. While I stood in line, I thought about the peculiarity of our tax system. For most Americans, April is a month marked by terrible stress, paper pushing and a last minute mad dash to get the taxes finished before April 15 (or the 17th, this year). People plan and pine and worry and most pay a sizable percentage (16-20 percent even for people of lower income brackets) of their annual income in taxes. Corporations? Not so much. The New York Times reported last March that for 2010, General Electric paid no taxes on $5.1 billion in U.S.-based profits. Behemoth Bank of America made $4.4 billion in 2009 and got back a very tidy tax return from the federal government — $2.3 billion. Most Americans are lucky if they can pay off an overdue credit card bill (probably from Bank of America) or treat themselves to a nice dinner out or weekend away with their tax returns. Verizon (can you hear me now?) “earned” $12 billion in 2010. That should mean a sizable tax burden here. But, as of 2011, the company has not paid anything in taxes for two years running. The list goes on. The corporate tax rate is supposed to be 35 percent. President Barack Obama is proposing lowering that to 28 percent. It kind of doesn’t matter, because it seems like no corporations pay anywhere close to 35 percent in taxes. Check this out. What is the most patriotic sector of our economy? The military industry, right? Lockheed Martin has the slogan: “We Never Forget Who We’re Working For.” That is totally ungrammatical — although doesn’t “we never forget for whom we work” sound a little snooty? Not only was the 2008-10 effective tax rate on the top 10 defense contractors less than half of the 35 percent official corporate tax rate, but the effective rate fell steadily from 2008 to 2010, from an already paltry 19.3 percent in 2008 to a tiny 10.6 percent by 2010. All of this brings me back to the post office, which is a regular site of Tax Day protest. For the last few years, I have joined friends from the New York City chapter of the War Resisters League for a demonstration in front of IRS headquarters near Times Square, and then a march — led by the energetic rhythms of the Rude Mechanical Orchestra — to the main post office near Penn Station. They say that fewer people go to the post office to file their taxes now that Turbo Tax and other e-filing businesses are so user friendly, but it is still a madhouse in my opinion. Crowds of stressed out, last minute tax filers; people dressed up like Red Bulls giving out free samples of energy drinks; shillers for various causes and perspectives (liquidate the Fed, Join the Tea Party, etc. ), the Granny Peace Brigade with their large flowered hats and complicated political lyrics, and news cameras all crowd the steps of the post office. It feels like a happening. No one (except for maybe Warren Buffett) likes paying their taxes and Tax Day is a great day to encourage people to think about how much of the money they fork over to the Internal Revenue Service ends up at the Pentagon. By WRL’s figuring (which includes the portion of the federal debt that comes from past war-making) 47 cents of every tax dollar goes to military. 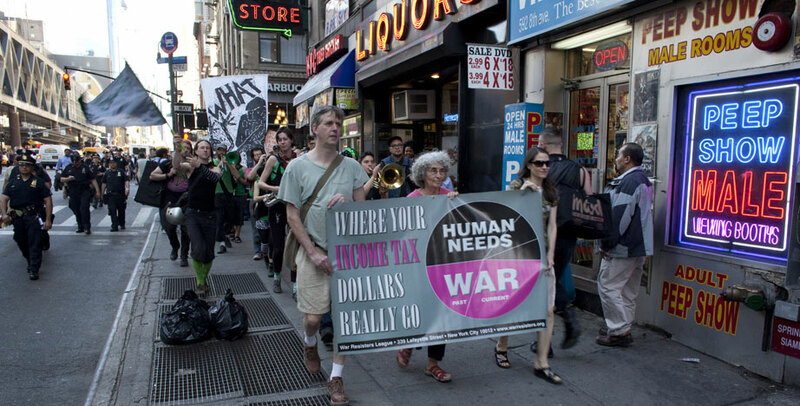 War tax resisters hand out information and call on passersby to consider the skewered nature of our national priorities: cuts to education and social services, more nuclear weapons research and development funding. They make the argument that being against war and violence requires withholding one’s own financial support from that war and violence. It is a perspective a lot of people are open to, but even though there are lots of resources on “how to” resist paying war taxes, a relatively small number of people are outspoken war tax resisters. This year, war tax resisters were joined by the Tax Dodgers and the Corporate Loopholers and union members, all protesting these unfair tax policies that have working class American paying a higher percentage of their income to the IRS than multi-billion companies like Boeing, Bank of America and General Electric. “It’s time for the big banks and corporations to pay their share of taxes like the rest of us do. The Flatbush community cannot afford any more cuts to the services we rely on in order to line the pockets of the 1 percent. We’re not going to take it anymore. Today we’re fighting back,” Leroy Johnson, New York Communities for Change chairperson for Flatbush told The Nation magazine. The connections are there. IranPledge.Org and other groups are putting the pieces together with a succinct flyer that connect unfair corporate tax policy and the need for war resistance. The kids of BAY (Bay Area Youth) Peace in Oakland have a great rap: “People, people, people, can’t you see? They kill around the world with tax money. Steal it from the workers, how their money’s made. I guess that’s why we’re broke and they’re still paid … They tax us more and more. The rich, they greedy. No money for health or to educate. I guess that’s why we’re broke and they’re still paid.” (I think I got that right). “I don’t care about war,” the flyer-ing woman responded. What? It is hard not to care about war when it is one of the reasons our economy is flapping and gasping like a fish out of water. That one grumpy person aside, there is a real opportunity to channel the frustration, outrage and really creative organizing against disparities in our tax policies into principled nonviolent resistance — including tax resistance — this election year. The question is how. Right on! Tuesday 17th I was at Bryn Mawr PA post office, handing out the WRL pie charts showing how nearly half of the federal budget is going to military expenditures. Fran and I are conscientious war tax resisters and mailed our federal taxes a few days ago, along with a letter explaining why the check was for less than the amount listed on line 76. Instead, a check for the missing amount was sent to UNICEF for needy children around the world. LET’S TRADE POST OFFICES, QUICKLY, NOW!! !